A&M: What can you tell us about the Army prepositioned stocks program? MG Gamble: The Army prepositioned stocks (APS) program constitutes one of the three legs of the strategic mobility triad: airlift, sealift and prepositioning. APS exists to reduce deployment response time and the initial amount of strategic lift required to support continental U.S. (CONUS)-based power projection and to sustain the Warfighter until sea lines of communications with CONUS are established and industrial base surge capacity is achieved. APS is owned by Headquarters Department of the Army and managed by Headquarters Army Material Command, Office of the Surgeon General, and the Defense Logistics Agency. There are several categories of APS: prepositioned unit sets, operational project stocks, Army war reserve sustainment stocks and war reserve stocks for allies. Prepositioned unit sets are built to reduce deployment response time and support the Army’s force projection strategy. Unit sets are comprised of combat equipment (known as major end items) and supplies (also known as war reserve secondary items). Operational project stocks are equipment not found in Army unit authorizations. These are tailored to provide key strategic capabilities required by combatant commanders in support of contingencies, humanitarian assistance and disaster relief. Army war reserve sustainment stocks are assets intended to sustain the fight by replacing combat losses and supplies consumed in battle. War reserve stocks for allies are owned and financed by the U.S. but released to the appropriate Army component commander for transfer to supported allied forces under the Foreign Assistance Act. APS are important components of total Army readiness and global force projection. As the Army becomes increasingly expeditionary, the ability to rapidly deploy troops from home stations to the battlefield with access to ready, modern, combat-configured equipment is paramount. Combat-configured APS serve as a strategic deterrent and, when called upon, APS provide the combat equipment required to respond rapidly and win. A&M: Where are APS located and what equipment is stored there? MG Gamble: APS assets are located worldwide in North America, Europe, South Korea, Japan, Kuwait, Qatar, and at Guantanamo Bay, Cuba. The equipment stored at each location is based on the operational needs of the combatant commander in the associated theater of operations. Critical equipment stored at the various locations includes major end items such as tanks and combat vehicles, medical equipment sets, engineering sets, and artillery systems that make up armored and infantry brigade combat teams, sustainment brigades, and other critical unit sets. A&M: What can you tell me about the transition from combat-capable APS to combat-configured APS? MG Gamble: The commanding general of Army Materiel Command, GEN Gustave Perna, directed the change in configuration of APS from combat-capable to combat-configured in order to increase combat readiness of APS sets worldwide and enable the rapid employment of units drawing APS. The Configured for Combat (CFC) implementation plan is in progress and runs through fiscal year 2024. Transitioning to a combat-configured APS program provides Soldiers with critical enabling technologies that provide decisive overmatch to shoot, move, communicate and protect. The ultimate goal is to store and issue equipment in a ready-to-fight configuration with command, control, communications, computers, intelligence, surveillance and reconnaissance enablers to allow for a quick response to any OPLAN [operation plan] or contingency requirement. A vehicle that is combat-configured includes all its corresponding basic issue items, combat enablers and Soldier technologies installed on the vehicle. The vehicle also contains high-performance fluids and receives more frequent routine maintenance. As a result, APS vehicles are maintained at a higher state of readiness and therefore enable deploying units to be employed more rapidly by the combatant commander receiving expeditionary Army force. A&M: Are there any examples of an APS equipment set that has completed or is in the process of transitioning from a combat-capable to combat-configured set? MG Gamble: The 403rd AFSB [Army Field Support Brigade] transitioned APS-4’s ABCT [armored brigade combat team] equipment set to a configured-for-combat posture during the last year. Combat-configured vehicles have all the basic issue items and Soldier technologies colocated, installed and configured within the platform. During the transition, the AFSB also rewarehoused the ABCT equipment, storing it by UIC to enable rapid deployment. APS-4 is managed and maintained by the 403rd AFSB and contains multiple brigade equipment sets, support element sets and a watercraft set. A&M: What are the benefits of CFC? MG Gamble: Maintaining and configuring APS equipment in a combat-configured state increases readiness, enables deploying units to rapidly draw and employ APS, and reduces intratheater distribution requirements, timelines to assemble APS unit sets from storage to issue configuration, and the amount of time the gaining unit spends in the tactical assembly area installing and configuring equipment. This leads to rapid employment of forces once on the ground. A&M: What are some of the challenges with the transition? 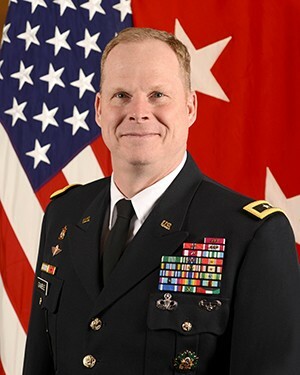 MG Gamble: Implementation timelines for CFC initiatives are aggressive, and modification to the Army Regulations and Technical Manuals governing the configuration and use of APS requires updates to reflect the shift from maintaining and configuring APS in a combat-configured versus combat-capable state. It’s a significant and lengthy effort to change Army regulations, and it is challenging leaning forward to implement CFC initiatives without supporting regulatory guidance. In addition, equipment authorized in APS unit sets did not historically include CFC enabling equipment; instead, APS unit sets relied, by design, on units deploying some equipment from home station and installing this equipment into APS combat platforms after they arrived in theater. Transition to CFC posture requires an increase in APS equipment authorizations in order to reduce or eliminate requirements of units to deploy. Authorizing new equipment throughout the program is a cumbersome process and forces APS to compete for modernized equipment that is often in short supply throughout the Army. Sourcing CFC enabling equipment also introduces new security requirements and labor skillsets into the program that compete for APS funding. A&M: Is there an example of an APS set being issued to a unit in the new configuration? MG Gamble: I have several examples. Most recently, the 401st AFSB completed the largest ever equipment issue from Army Prepositioned Stocks-5 on July 9. The 401st AFSB issued a full armored brigade combat team equipment set to the 155th ABCT in support of Operation Spartan Shield. More than 13,000 fully mission-capable pieces of equipment were issued to the 155th ABCT during the process. Only five end items were deemed non-mission-capable. These are being repaired and will be issued once they are ready. The equipment draw with the 155th ABCT was excellent in terms of readiness levels, efficiency and attention to property accountability. CFC equipment sets contribute to all of those things, but most importantly, we want to make sure our capabilities with APS equipment are effective. We had been testing and fine-tuning the assembly and issue process with CFC equipment sets since the beginning of the year in order to maximize effectiveness. The 401st AFSB issued 257 pieces of equipment from an Army Prepositioned Stocks-5 armored brigade combat team set during an issue exercise in January. The exercise, led by the Army Field Support Battalion-Kuwait, was intended to test the battalion’s ability to rapidly issue newly combat-configured equipment and test the overall functionality of combat configuration concepts. Soldiers with the 1st Battalion, 37th Armored Regiment, 2nd ABCT, 1st Armored Division (2/1 AD) acted as the gaining tactical unit for the exercise. The exercise provided an opportunity for the AFSB-Kuwait to show and teach Soldiers how equipment is supposed to be arranged on a platform. It also provided an opportunity for the gaining tactical unit to give feedback about the equipment based on combat experience. When a fault on a vehicle is identified during the issue process, the 401st AFSB maintenance teams attempt to fix the fault within two hours. If a repair can’t be made within two hours, the vehicle is replaced with another of the same platform. The speed at which a non-mission-capable vehicle can be replaced with a fully functioning vehicle is greatly improved through combat configuration of APS-5 equipment sets. The 401st AFSB issued the first combat-configured equipment set from APS-5 to the 1st Battalion, 37th Armored Regiment, 2/1 AD, in May. It marked the first time a fully combat-configured equipment set was issued from APS-5 since the transition from combat-capable to combat-configured began in 2017. A total of 2,222 pieces of equipment were issued from APS-5 in the form of a combined arms battalion and forward support company. Issuing that combined arms battalion to 2/1 AD was significant because we were able to truly hone our processes and build confidence in our ability to put this equipment in the hands of the Warfighter both safely and effectively, and it allowed for equipment to move forward ahead of the 155th ABCT’s arrival so there would be no gap in coverage for the OSS area of responsibility while those two brigades rotated in and out. A&M: How confident are you in the readiness of APS assets? MG Gamble: I am extremely confident in the readiness of global APS assets, and ongoing CFC initiatives continue improving readiness and speed of deployment and employment. In the past, units falling in on APS deployed with their organic enabler equipment and installed and configured after issue. This process could require weeks and months impacting the deploying forces’ ability to respond to a crisis. While the CFC initiative is not fully funded for full spectrum operations, the Army begins receiving partial funding in fiscal year 2019. Implementation is prioritized to enable the most critical platforms and sets first, equipping them with command, control, communications, computers, intelligence, surveillance and reconnaissance equipment such as radios and mounts, vision enhancement equipment, and friendly force tracking platforms. Combat-configured APS equipment improves readiness, saves time and reduces the burden on strategic lift capacity.